WordPress is one of the most powerful CMS, that goes with outstanding functionality and can be powered up with the help of various plugins. In this short tutorial we’ll find out how to download WordPress. To install a WordPress template that you’ve purchased, first, you need to download and install the WordPress package. Download the latest WordPress version at the official WordPress website. Once you’ve clicked Download WordPress button, you will see the window offering you to save the file to the location selected by default. Click OK button, or the file will be saved automatically, depending on your browser configuration. When all the previous steps are done, a wordpress.zip file will appear. You need to unzip the files and then archive them again before uploading them to your server. First, right-click the wordpress.zip file and select Extract option from a dropdown. You will see an unzipped wordpress folder. Open the folder. It will contain another folder called wordpress. Open it to see the content. There is a bunch of files and folders in the wordpress folder, that should be uploaded to your server to start installing WordPress. You can use File Manager tool, which allows to upload a zipped folder, and then unzip it on your server. 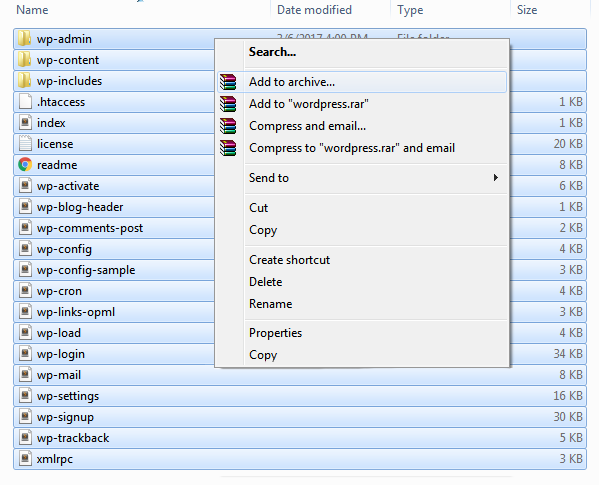 Select all files in the wordpress folder, right-click the selection, and choose Add to archive option. Select ZIP as archive format and click OK button. Now you will see a new wordpress.zip file. It should be uploaded to the server.